She was told it's a symptom. It's actually the key to saving the world. As Halen Windspeare returns to the place her father drowned, she thinks controlling the sparks beneath her fingertips is her only problem. But when she is dragged into the underwater realm of Elosia, she discovers she is the solution to a century old conflict. Earth is on the path to destruction at the will of a sinister siren, and Halen is the only person powerful enough to stop him. She's not ready, but the fate of the world rests solely in her hands. Read an excerpt on Wattpad. 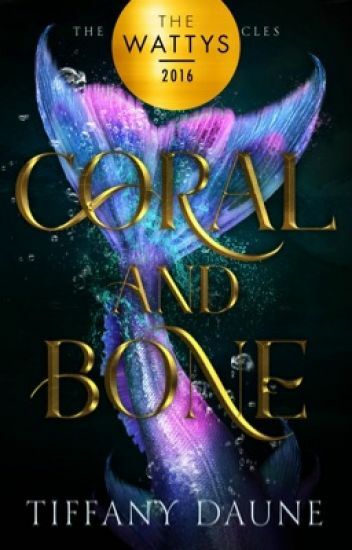 Coral and Bone is the first book in the Siren Chronicles. ⭐️Soon to be an Interactive story on the Chapters app! It's 1860, and after a childhood spent on the grueling frontier of the Old West, Mae Clemens has finally found a place that feels like home. Wanting nothing more than to make friends and put down roots, Mae soon meets her match in Autumn, a haughty, free-spirited young wood nymph stranded in the realm of humankind. Autumn is desperate to escape Mae's hardscrabble world, but survival soon takes precedence. Vicious outlaws plague the drought-stricken town, and deadly fear grows with the mystery of missing children. But the mundane world isn't the only source of danger - there's a monstrous evil waiting for the two girls, and an ancient trickster with his own plans for their fate, whatever it may be. Winner of the 2015 "Hidden Gems" Watty award (the world's largest online writing contest), Oakwood Grange is a thrilling all-ages adventure that blends spellbinding fantasy with gritty Western sensibilities. Immerse yourself in an enchanting story of heartwarming beauty and timeless Americana, as debut author Rhón asks questions about innocence, friendship, and the evergreen importance of home. In an achingly real world touched by myth, two girls set out on a journey of discovery, but one they may not survive. All war is deception. Even after your enemy is dead. When Mediator Hawkins, a smart mouthed, smoke wielding detective recieves a faulty black grimoire it causes suspicion that attracts more than he bargained for. After being inadvertently contacted by the Mist Maiden, Nivara he gets caught up in a conspiracy he never wanted to be a part of. Already preoccupied with finding a way to stop the Truant curse from turning Beggars End into a mortuary, he must decide between protecting his home or forging ahead to stop a bigger threat on the horizon. Nivara, the Last Mist Maiden helps watch over the ever changing city of Opalis,  protected by an anti demon barrier known as the Divide. But it cannot keep them all safe for long. Forces inside the city are rising up against the recent Truant disease sweeping the slums, turning them into mindless zombies. It's a ticking time bomb which not even she can hope to cure. Stuck between worrying about the past coming back to haunt her and the current state of her city, Nivara has to help uncover the truth behind the Night Rider's death and stop whatever plans she put in place before her untimely demise. The ties between good and evil become blurred at the cost of a single life. A single choice that could save them all or end thousands of Traited for good. Sometimes the best laid plans aren't as simple as they seem. **Completed**Can smoldering resentment and attraction exist at the same time? Jess Parker has made a number of mistakes. The first was burning her school to the ground. The second, getting caught by the handsome, yet maddening boy who calls himself Asher, who tells her things that can't possibly be true. Now Jess finds herself blundering through a new and alarming world, leaving a trail of blazing destruction behind. She must choose between warring factions, two sides of an ancient war that both want her. And most of all, she must try to harness her explosive powers before they consume her. Note: FIRE is a stand-alone book set in the Jotun world. It is not book 2 of the Frost series (that will be published by Patchwork Press later this year). Aceria is a corrupt land, under the rule of a tyrannical King, and Fyra, a thief who is more than she seems, has seen the kingdom's suffering firsthand. She has wandered the impoverished towns and cities, running from the past. She saw her mother killed in front of her and has watched people with gifts like hers burned, drowned and imprisoned. She doesn't believe she has the strength to change anything. Fyra is keeping secrets: about who she is, her affinity for fire, and the dark forces poisoning the kingdom. When she is caught and brought to Castle Bluedale, the place she has only seen in her nightmares, she befriends the prince, a charming yet infuriating mystery. But her past comes back to haunt her, and new enemies in the castle bring her nightmares to life. Somewhere... down the rabbit hole, over the rainbow, and straight on till morning... there is a world beyond the one we know. It is a small island of life, an insulated bubble in a vast, frozen desert. These "Lasting Lands" are home to diminutive gnomes, gargantuan trolls, spellbinding elves, and a secretive family of goblins pulling all the strings. And living among them is an underclass of "Shadows" who look a lot like us. Adelaide Batiste is a girl with two souls. Her other self―her secret self―is a restless spirit named Ada. Together, the pair make their way across the lightbridge to Ozghard, where a dangerous chain of events is set into motion. Between two worlds, the girls uncover the truth of their past, which leaves them tumbling headlong into an uncertain future. When the fires of Etlis threaten to consume the Earth, suspicions around Asair's death ignite restlessness within the realms. Halen thought she had killed Asair, but now it's not so clear. Is his voice in her head just her imagination, or remnants of his soul that he can piece back together? As Halen and Dax hide out from the Hunters, she uncovers secrets once buried deep that have her questioning everything once again. With her life and the lives of those she loves hanging in the balance, Halen must race against time to fix her mistakes before it's too late. Curses and Ash is the mesmerizing sequel to Coral and Bone. Coming May 31rst. Pre-order now on Amazon! Coming soon to Chapters Interactive Games! What if you had the chance to be super human? Or the chance to be immortal? Aria Parker gets that chance. She's chosen for a competition to compete for "The abilities" And for the chance to become immortal. Can a sixteen year old girl really beat 400 other teenagers?